wondering if there was any other place in India offering a pleasant dive experience. Our favourite dive spot will always be the Lakshadweep islands but the time and expense and the logistics of reaching there don’t always make it worthwhile. So after much research we decided to explore Netrani Island, off the Karnataka Coast. Netrani is an 18-hour drive from Mumbai. We decided we would drive to Goa (12 hours), spend 2 nights and a day lounging on the beach, meet up with some friends, and then drive off with them to Murdeshwar. From Murdeshwar, Netrani is 10 nautical miles, or 75 minutes on a slow fishing boat. We had heard that the island is small, pretty, full of nesting birds and with incredible fish life bustling around. With depths ranging from 6 to 40 meters, the island offers diving suitable for all levels of experience. Some friends reported seeing six Orcas, adult Killer Whales, in May of 2000. But that’s a rare sight and we didn’t expect to see such miracles. We did hope for good visibility underwater, lots of marine life and maybe some adrenaline rush from White Tip or Black Tip Sharks gliding by. We had already been warned that the Indian Navy sometimes uses the island for target practice, and at those times, there is a huge fusillade of incoming shells that blast everything to smithereens. The 600 km drive from Mumbai to Goa is beautiful despite the narrow two-lane highway. The first 60 kms out of Mumbai are horribly slow and crowded as is the last stretch into Goa. Barring that, it’s an absorbing drive through undulating countryside with incredible views. We reached Goa and headed straight for Baga, our favourite spot. It always has plenty of action with shacks on the beach where one can listen to good music, watch the lapping waves, sip the local Cashew Feni and savour an incredible variety of sea food. Two days later we met up with our friends, picked up the dive gear, and drove off to the temple town of Murdeshwar, six hours away. The drive is incredibly picturesque, particularly the stretch on the Karwar coast. 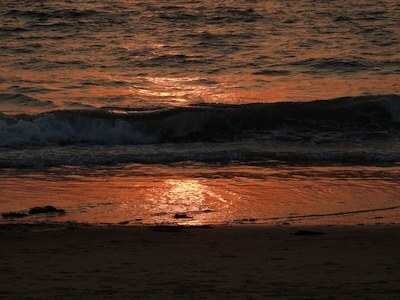 When we reached Murdeshwar, the sky is pink and the sun is just setting over the ocean. The next morning, after an early breakfast, the dive gear was loaded on to the fishing boat. Concerned about the stories of the Navy using the island for target practice, I decided to ask the local fishermen about it. Their conflicting versions didn’t give much comfort. One claimed that the Navy informs the local police station, which in turn informs the fishermen. Another stated that a Navy helicopter comes and reconnoitres the island and warns boats off before the shelling starts. I was no wiser about how the Navy warns divers underwater. Or people picnicking on the island who can’t be spotted through the thick canopy of trees. We headed off. On approaching the lee side of the island from the east, we spotted sea eagles and, incredibly, goats. We learn that the island has a temple as well as a mazaar, and in April, pilgrims come and release goats or chickens as offering. The west face is denuded after being punished by the sea, the winds and the gunnery. Mental images flash of goats, chickens, nesting birds and the marine life reacting to the shelling. We anchor on the South to spot a subterranean cave. The fisher folk say that the cave opening leads all the way through to the other side. But the surf pounding on the rocks discourages us from exploring it. As we kit up, check air pressure in the tanks and adjust the buoyancy jackets, the sea breaks gently on the rocks, sea eagles cry overhead and the green island beckons. There is movement below the surface of the water and I throw a biscuit overboard. Soon hundreds of red-toothed triggerfish surface and the dive looks promising. Their teeth are supposed to be so sharp that they can penetrate fins of divers through and through. Underwater there is 8 to 10 metre visibility. It’s not as good as we have encountered on some dives but it is a relief from the murky seas off Goa. The water is warm except for occasional cold currents that suddenly rise from the ocean deep. But its those currents that bring in plankton that in turn feed the fish here and also bring with them the larger visitors like sharks. We do four dives over two days and get to see plenty of marine life. 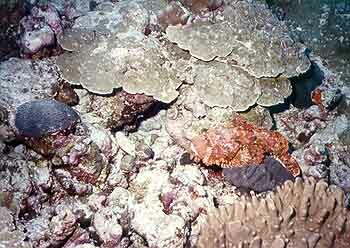 Huge parrotfish nibble at rocks and small patches of coral. Leopard moray eels and white-eyed morays peer short-sightedly at us from crevices. 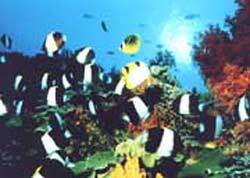 There are jacks, snapper, batfish, jellyfish, banner fish, moorish idols, puffers, sea urchins, sea slugs and juvenile groupers. On two occasions I spot large groupers one and a half times my size. Then, camouflaged on the ocean floor, blending with the sand, we spot a pair of scorpion fish and again incredibly, two pairs of stonefish equally well camouflaged. Then a nudibranch. Since we are not diving to very great depths, the air supply in the aluminium tanks lasts long and gives us approximately an hour for each dive. 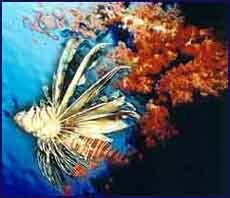 On each Scuba diving holiday there is one particular dive that stands out in memory. In this case it was the first dive on the second morning. We anchored off a rocky outcrop on the south of the island. As soon as we descended we were surrounded by a variety of fish in all colours. For the next hour we were followed by hundreds of triggerfish wherever we went. It was an incredible sight watching a canopy of blue circling just above us in a clockwise direction. And then suddenly as if from nowhere another layer formed above: a large school of barracuda. It made an incredible five layered picture. The sun filtering and shimmering through the surface of the waters which rippled above us, below it a menacing silver layer of barracuda circling in a counter clockwise direction, then blue triggerfish in hundreds circling in the opposite direction, and below this five mesmerised divers; with the rocks and sand beneath. Within this larger picture there were myriad colours and forms. 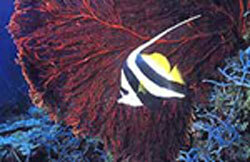 Yellow and black bannerfish, butterly fish, and moorish idols. Dark batfish and surgeonfish. Brilliant brown and yellow angelfish. A host of marine life. Then suddenly I spot a well known silhouette. A shark like figure emerges from the gloom and heads straight for us. For some reason I take no evasive action nor even prepare myself in any way. I somehow expect it to move away at the last minute. It comes close: within 4 metres and then turns away. Later, five of them flash past at an incredible speed contrasting very markedly with the unhurried pace of the barracuda and triggerfish that circle above. Back in the boat we have a debate on whether those were sharks or not. Venkat says they were cobias. As for me, I like to believe what I want to believe.